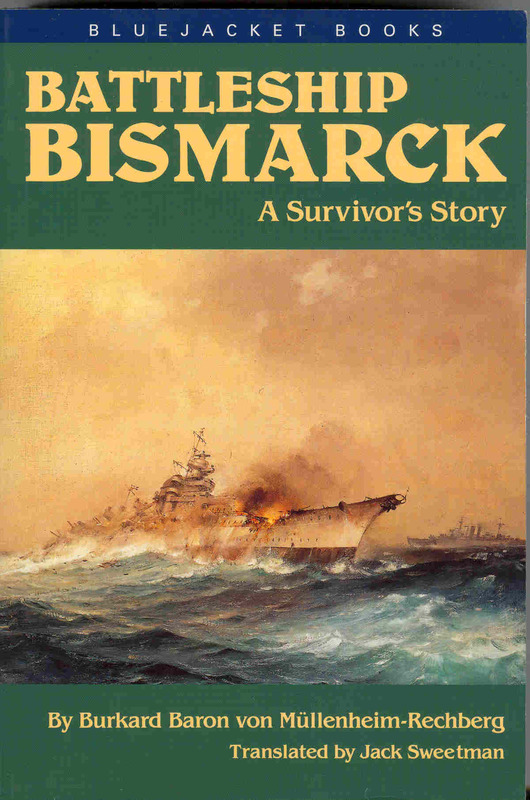 Originally printed in 1980 and again in 1990 by the Naval Institute Press, Battleship Bismarck – a Survivor’s Story was reprinted by the Naval Institute’s “Bluejacket Books” in 2002. Having long wanted to read this book, I finally picked up this newest reprint and eagerly looked forward to reading it. I was not disappointed. In the original printing, the book was mainly about Bismarck and her tragic voyage. This reprint of the second edition is an expanded volume, in which the author paints with a broader brush, giving you a portrait of not only the Bismarck and her tragic voyage, but of life in Germany under the Nazi’s. Müllenheim – who came from an aristocratic background – paints himself as someone who was anti-Nazi from the start, and only serving his country. The tale begins with a chapter on the background Bismarck’s Captain, Katpitän zur See Ernst Lindemann. It is obvious from the beginning of the book that Müllenheim held Lindemann in very high regard and was very fond of his commander. The book continues through commissioning, working up and then the breakout into the Atlantic. Intertwined among the story of the ship is the story of Müllenheim and the story of Germany – how Müllenheim spent time in London as a naval attaché at the German embassy, how Hitler lead Germany down the path to war, how the author’s career as a gunnery officer began and how he came to be assigned to the Bismarck. Müllenheim also gives some background into the German Naval High Commands decision to send Bismark and Prinz Eugen on their fateful voyage. 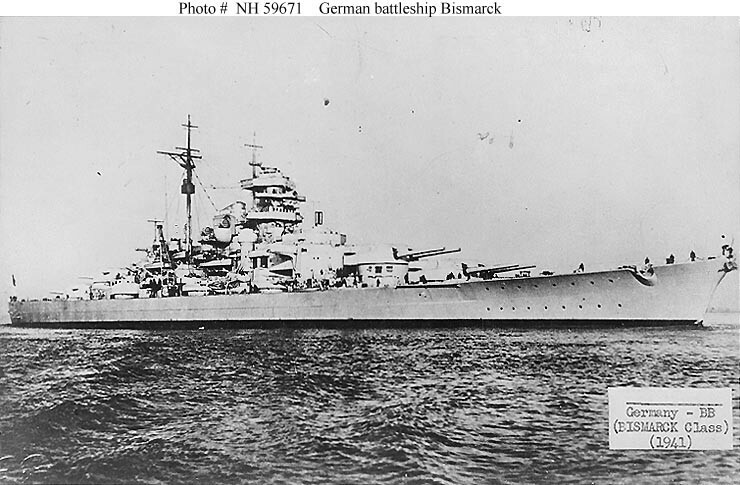 Originally, the sortie was conceived of Bismarck and Tirpitz joined by Gneisenau and Scharnhorst. 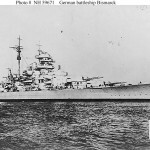 The problem with that was that Scharnhorst was undergoing an engine overhaul and in early April 1941, Gneisenau was damaged by an aerial torpedo and bombs from a British air raid on Brest. Additionally, the Tirpitz had only been commissioned in February and was not ready for service. 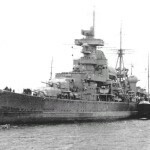 Consideration was given to delaying the mission until either Scharnhorst finished her engine overhaul in France or Tirpitz finished working up in the Baltic. In fact, Admiral Günther Lütjens lobbied for a delay in sailing until either one of the battle cruisers were back in action. 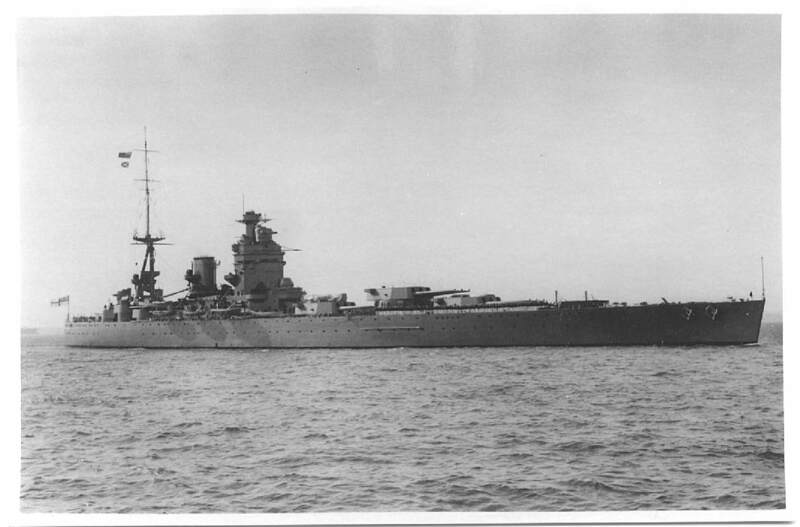 Instead, the Seekriegsleitung (German Naval Command) and Admiral Raeder decided it was better to immediately contest the British in the Atlantic with a smaller (Bismarck and Prinz Eugen) force than waiting for more ships to be ready to engage in commerce raiding. One interesting tid-bit I read and didn’t know was the Tirpitz was in Baltic beginning her work up to operational status as Bismarck was preparing for her sortie. What a site that must have been! Ominously, the German’s had discovered that damage to the ships rudders would leave her unable to maneuver in any type of sea. They had no inkling of the implications of this flaw in the design. The book continues as Bismarck and Prinz Eugen departed on their mission. Müllenheim felt that the mission was compromised from the start, especially once they were spotted by the Swedish warship Gotland en route to Norway. Once in Trondheim, he touches on the decision by Lütjens not to top of the Bismarck’s fuel – a decision that was to prove fatal. 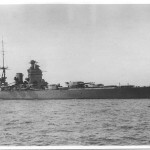 Lütjens (who didn’t have a good cruise) made his next mistake during the breakout, when he decided not to sail at top speed while heading for the Denmark Strait under the cover of bad weather, even after his weather officer warned him this could cause the Bismarck to lose the cloak of weather she was hiding in…which she did. The British knew the big German bruiser was going to breakout. The question was…where? 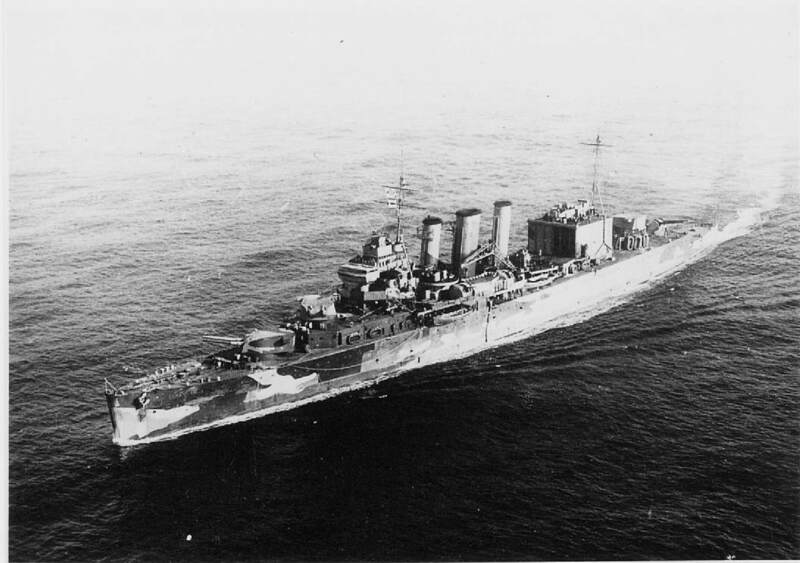 Patrols were stepped up in the Denmark Strait and the Faeroe’s Gap. 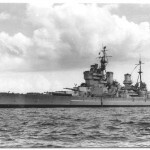 It was in the Denmark Strait that the German warships stumbled into the British cruisers Suffolk and Norfolk. 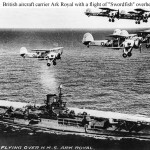 As the word reached Admiral Tovey in the HMS King George V in Scapa Flow, British units began to race to the Denmark Strait to cut off the Germans. Tovey left Scapa Flow and joined up with the Battlecruiser Repulse. 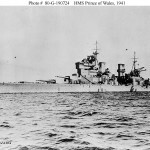 Ahead of him the legendary British battlecruiser Hood led the brand new battleship Prince of Wales on an intercept course. Even casual history fans know how the Bismarck dispatched the “Mighty” Hood to a watery grave after just a few minutes of combat in the Denmark Strait. 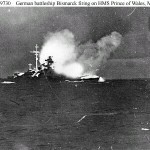 Müllenheim goes into some detail on the damage sustained by the Bismarck in the engagement and the reported argument between Lindemann and Lütjens regarding the wounded battleship Prince of Wales. The former wanted to finish her off, while the later decided to retire from the scene. The author also analyzes Lütjens’ options at this point, why the Admiral made the decision to cut the operation short and head for France instead of turning back for Norway and how the decision not to refuel now became critical. 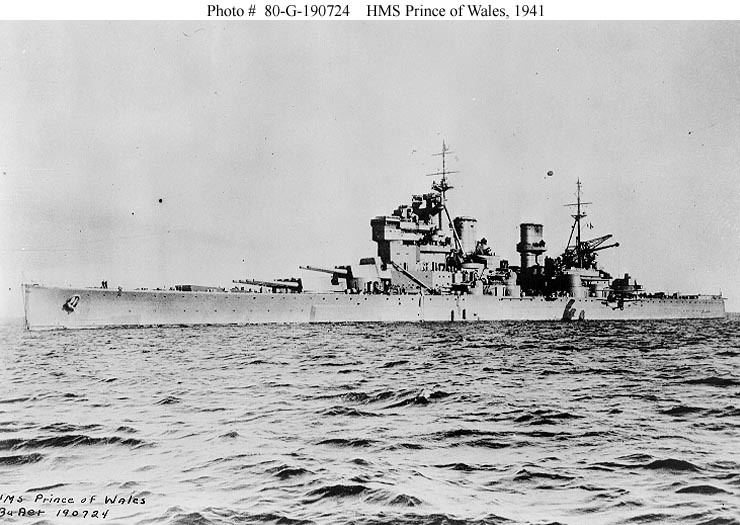 In short, Prince of Wales had cut Bismarck’s top speed from 30 to 28 knots with a 14″ hit in the German raider’s forecastle. In addition to the structural damage, fuel oil in tanks at the fore of the ship were now un-available. In order to conserve fuel to make it to Brest, the Bismarck had to lower her speed. Had Lütjens topped off the Bismarck in Norway, he may have been able to outrace the British to safety. An additional issue was the British radar. 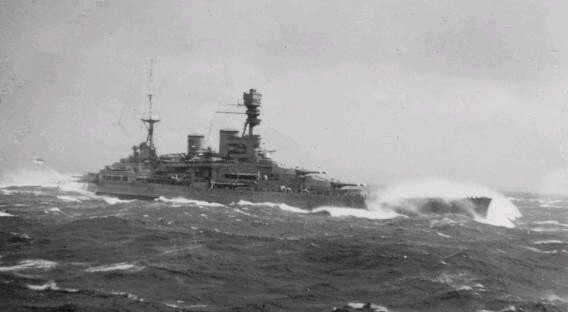 Lütjens was extremely flustered and surprised by the fact the Norfolk and Suffolk’s radar was much more powerful and capable than the German’s had thought – something which came to light when Bismarck was unable to shake the pursuers in the Denmark Strait. This led to Lütjens’ next – and possibly biggest – blunder. The fatal error happened when the Bismarck finally shook her pursuers. The British pursuers were zigzagging while following the German dreadnought, trying to keep out of gun range. At the farthest point of this maneuver, they lost contact with their prey, but would regain it on the next inbound leg. On one such maneuver, the Bismarck turned away from her pursuers, looped around the British and made for France. The British thought she had turned deeper into the Atlantic and followed. This meant the British were heading west while their target was heading east. Unfortunately for the German’s, Lütjens’ decided to make a 30 minute long report to his commanders right after this. He thought that the British radar would still be able to track him over the horizon, and hadn’t realized he had shaken off this shadow. 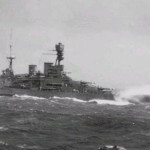 Using radio direction finding, the British were able to plot Bismarck’s position and began the famous “chase”. 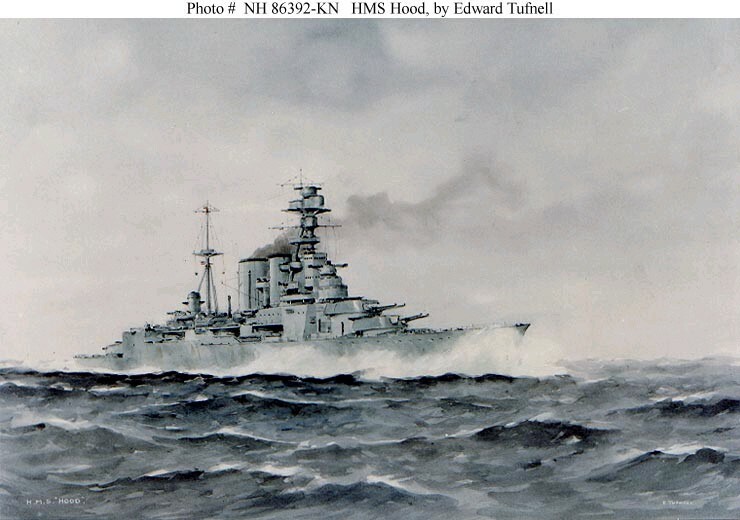 Every available ship was thrown into the effort as the British vowed to “Sink the Bismarck” and avenge the Hood. 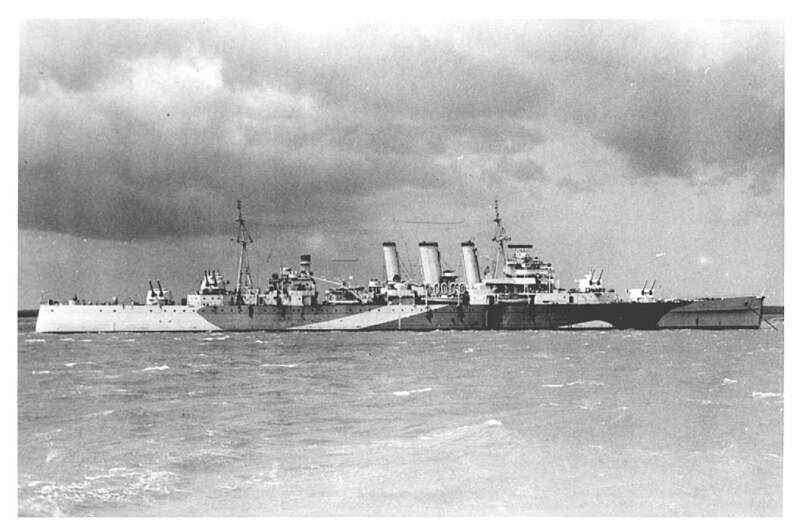 From north, south, east and west British ships converged on the German battlewagon’s last know position as search planes looked for her. During this period, the mood on the Bismarck was good. The crew thought nothing could catch them – they did not know of Lütjens lengthy message – and began thinking of what they would do once they got to France. 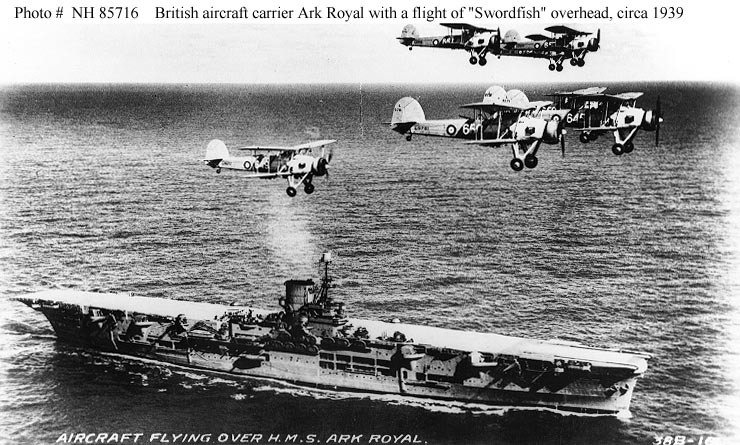 The engineering department even built – but never put up – a fake “second funnel” to fool Allied aircraft into thinking the Bismarck was a British ship. Bismarck was spotted by a Catalina and then attacked by Swordfish aircraft until a torpedo from the Ark Ronal’s last gasp attack struck her in the rudder and sealed her fate. 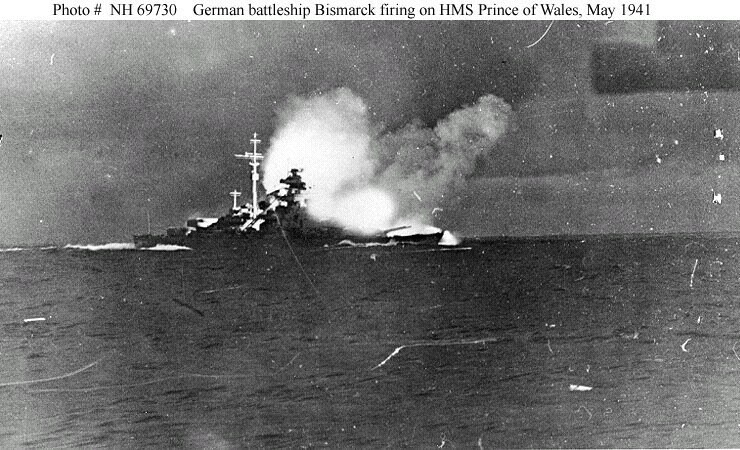 If this last air attack had failed, the Bismarck would have basically been home free, as the fuel situation on the British ships was critical and they would have to break off the chase. As described by Müllenheim, the mood on the ship at this juncture was one of resigned fatalism. How could this have happened? Surely their beloved Katpitän zur See would be able to get them out of this. After enduring a night of pesky but ineffective British destroyer attacks, the German’s were resolved to meet their fate. Müllenheim insists that while the Germans were depressed at their plight, discipline and order were still at a high level on the ship. That was in contrast to earlier accounts that I had read, which stated the Germans were tired and demoralized. He also goes into detail here and in an addendum on the efforts to free the jammed rudder. 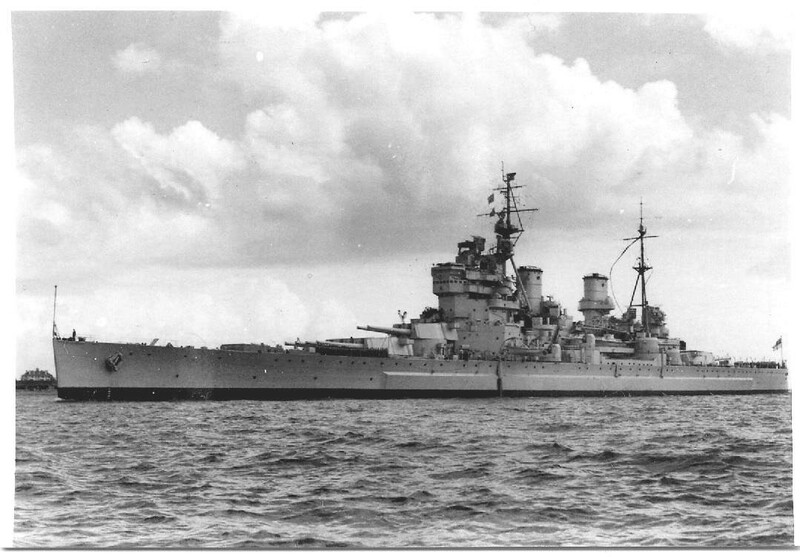 Finally, the battleships King George V and HMS Rodney arrived on scene on the morning of May 27, 1941, determined to sink the German ship. Müllenheim points out that other than her rudders, the Bismarck was in perfect operation shape. 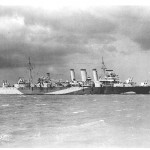 She was still capable of making 28 knows, but was only making 10 knots because the German’s could not steer the ship. It was this inability to steer that doomed the Bismarck in more than one regard. Not only could she not escape the British, but her inability to maneuver meant that she could not effectively use her fire control apparatus nor evade the British attacks. In fact, one the battle was joined, Bismarck quickly found the range on Rodney, neatly placing a straddle around the British battleship before her own range finder was shot away. The British concentrated on the foreword part of the ship, quickly making it a burning wreck. 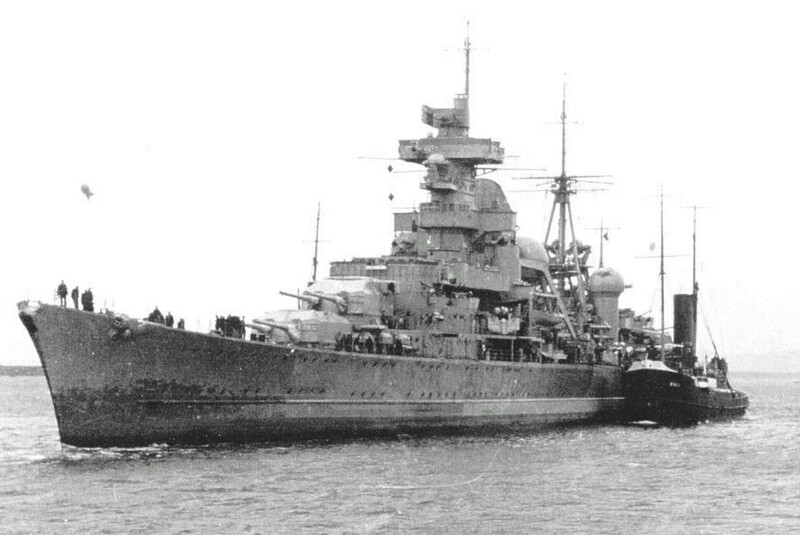 When communication with the bridge was lost, Müllenheim took over control of turrets Caesar and Dora. 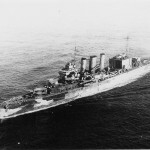 He targeted the King George V, and quickly had straddled her. He was about to fire again when his rangefinder was shot away. At that point the turrets went into local control – which was mostly ineffective. By this time the Bismarck was a basically destroyed as a fighting unit, but Admiral Tovey was determined to sink her, so the British kept firing. The author interweaves his own escape with the stories of over survivors and their own exodus from the ship. He insists that the Germans did indeed scuttle the Bismarck, but in the end does it matter who “sunk” her? 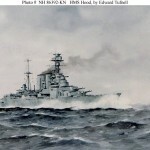 She was finished as an effective fighting unit by the time the British battleships had to retire from the scene. An interesting side note was the story of how many survivors saw Katpitän zur See Lindemann make his way to the bow of the ship and salute as he went down with his ship. Müllenheim was one of the lucky few to be picked up by British ships before a U-Boat scare caused the would be rescuers to bolt, leaving over a thousand men to their fate in the cold Atlantic. Brought to England, the rest of the book details Müllenheim life in the various prison camps in England and then Canada. The ever organized German’s set up schools, bands and stage groups, and the author chose to use his time wisely and begin studying for a career in law. It was in the prison camps that Müllenheim decided not to hide his disdain for Hitler and the Nazi’s, a stand which put his life at risk. Surviving the prison camps, Müllenheim went on to a career in law and then in the government of the Federal Republic of Germany. He even served as Consul General in Toronto, not far from were he was imprisoned during the war. 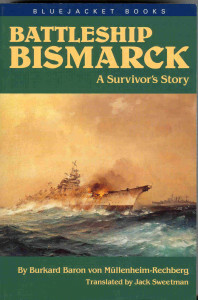 Battleship Bismarck – a Survivor’s Story, was one of the those “I have to read that someday” books that I finally got it. It was well worth the wait. I found it an interesting account of the voyage of one of history’s most famous ships from the German side. I highly recommend it for naval history buffs who want to learn more about the Bismarck and her short, tragic life.